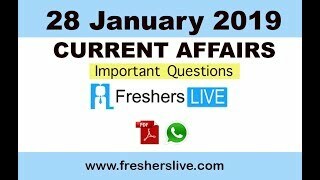 Current Affairs 28th January 2019: Instantly obtain Latest Current Affairs 28th January 2019 with all essential info, Be the first to know all the Current affairs 28th January 2019 top news, Major Issues, Current happenings, Important events in National as well as International level with clear explanation. For all competitive exams and Interviews, equip yourself with the Latest Current Affairs 28th January 2019 granted here. The Visakhapatnam Port Trust (VPT), the only major port in India, has met its total energy requirement from solar power generated by its captive plant. It has achieved the incremental growth during the current fiscal year three months ahead of the schedule. Now, the VPT is generating 17 million units of power per annum. After meeting the requirement of the port and its BOT operators it is selling the surplus to the Andhra Pradesh State. Union Minister Nitin Gadkari inaugurated four-lane, 5.1-kilometer long “Atal Setu”, the third Cable bridge across river Mandovi in Panaji, Goa. This is the third bridge across Mandovi River. This bridge would overcome the bottlenecks and curb traffic jams at Panaji Circle and Panaji entrance. Assam government entitled the Republic Day Journalism Award 2019 to veteran journalist and former editor Dhirendra Nath Chakraborty. The award comprises Rupees one lakh in cash, a citation, the Assamese ‘xoraai’ (the bell metal memento presented as an honor), ‘jaapi‘ (headgear) and an angavastra. The Pakistan government declared sugarcane juice as the “national drink” of the country. The government of Pakistan declared sugarcane juice as the nation juice of Pakistan. The Poll includes three option including orange juice, carrot juice, and sugarcane juice. But it is sugarcane juice which won the poll with 81 percent votes. Over 7,600 people participated in the poll and declared sugarcane as national drink ok Pakistan with 81 percent votes. Madhya Pradesh Chief Minister Kamal Nath launched ‘Yuva Swabhiman Yojana’ for youths of the weak section in urban areas of Madhya Pradesh The scheme was launched in Chhindwara, Madhya Pradesh The main aim is to provide employment to the youth belonging to the weaker section of the society mainly in urban areas of the state. Under this scheme, 100 days of employment will be provided. The Oxford Dictionaries announced that the word ‘Nari Shakti’ which is derived from Sanskrit has been chosen as the Hindi Word of the year for 2018. The Announcement was made during a session at Jaipur Literature Festival which is being held at Diggi Palace in Jaipur, Rajasthan.